Welcome to the Press section at Thatsmyshirt.com. Our cool t-shirts have been featured on television and in movies. Our trendy t-shirts have also been worn by celebrities in their everyday lives and discussed on blogs and in newspaper articles dealing with t-shirts. Check this page often to see our most recent press as it is added. Our t-shirts always give the media something to talk about due to their cool, trendy nature and celebrities love wearing them. We sell an enormous selection of t-shirt so their is always something for everyone to talk about. Our vintage rock t-shirts are often worn by celebrities to show support of their favorite bands or because they simply like wearing cool vintage rock t-shirts. You may have seen some of our retro brand t-shirts and vintage t-shirts on TV shows such as Entourage and also in movies such as Stepbrothers and The Hangover. Our T-Shirts have been included in gift bags at award shows such as The Grammy's, Emmy's, Oscar's, and MTV Music Awards. If you have press inquiries please use the contact form in the contact us tab at the top of the screen and we will get right back to you. We can provide sample tee shirts if needed and we have worked with many companies in a barter format. Below is a video regarding our vintage t-shirts which was featured on a vintage t-shirt segment on Fox 5 News in New York City. The featured David Bowie vintage rock t-shirt by Junk Food was a top seller for months here at Thatsmyshirt.com. Below is a picture of Miley Cyrus for Twist Magazine that featured another line of tees we sell called Imaginery People. These vintage style boutique t-shirts are very popular and can be seen everywhere and on everyone! 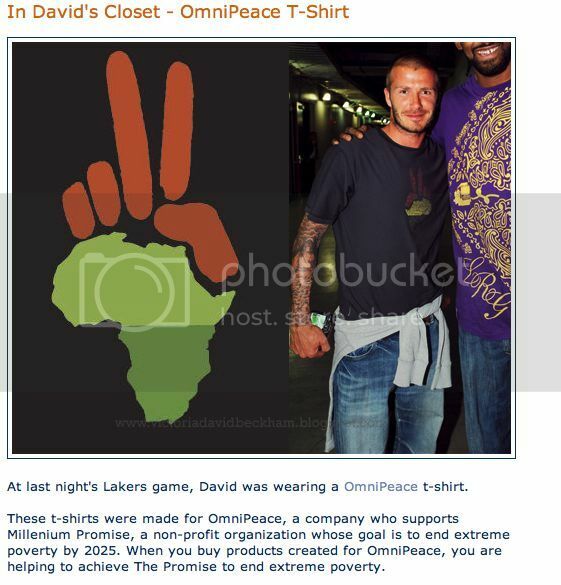 David Beckham was pictured below at a Lakers Game wearing one of the Junk Food Omni Peace t-shirts we sell. Proceeds on Omni Peace t-shirts go to an organization that fights Poverty. These T-Shirts are available for men and women and are very cool.